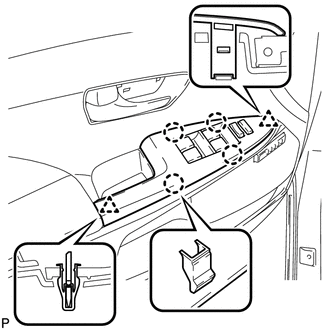 (a) Engage the 7 clips and install the front door panel protector. (a) If reusing the front door weatherstrip. (1) Clean the front door weatherstrip. 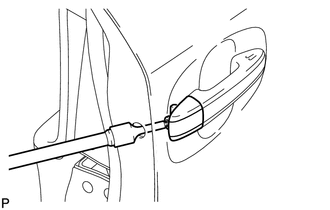 (2) Remove the double-sided tape from the front door weatherstrip. 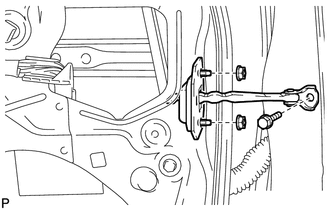 (4) Apply new double-sided tape to the front door weatherstrip as shown in the illustration. (b) Clean the front door panel sub-assembly. 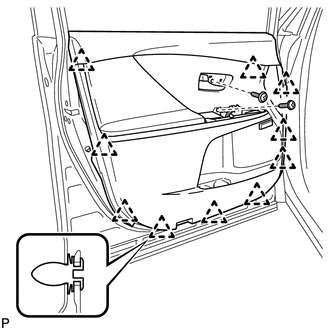 (c) Engage the 20 clips and install the front door weatherstrip. 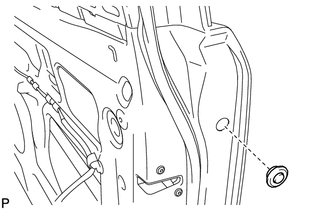 (a) Apply MP grease to the sliding areas of the front door check assembly. 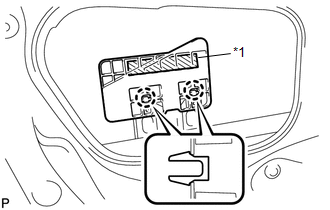 (c) Install the front door check assembly with the bolt and 2 nuts. 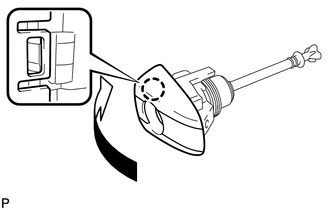 (a) Install the front door lock open rod as indicated by the arrows, in the order shown in the illustration. 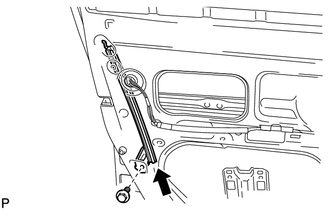 (a) Apply MP grease to the sliding parts on the front door outside handle frame sub-assembly. 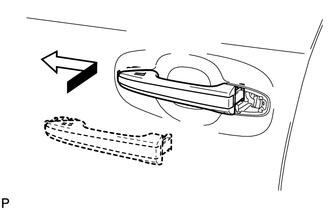 (c) Using a T30 "TORX" socket wrench, install the front door outside handle frame sub-assembly with the screw. 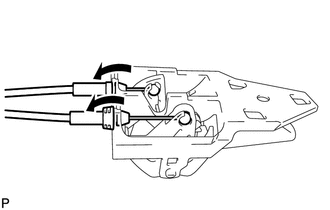 (a) Engage the 4 clamps and install the electrical key wire harness. (a) Install the front door inside locking cable assembly. 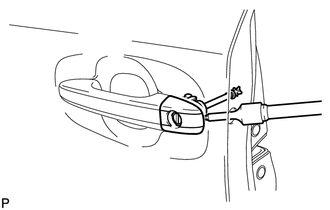 (a) Install the front door lock remote control cable assembly. 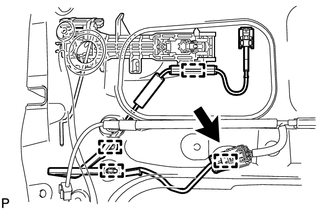 When reusing the removed front door lock assembly, replace the door lock wiring harness seal on the connector with a new one. Reusing the door lock wiring harness seal or using a damaged door lock wiring harness seal may cause water intrusion. This may result in a malfunction of the front door lock assembly. 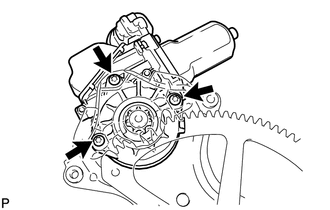 (a) Apply MP grease to the sliding parts of the front door lock assembly. 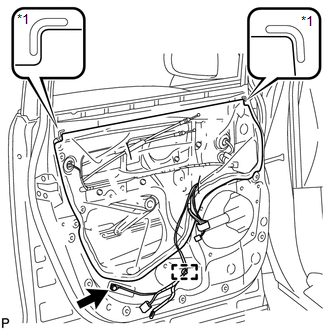 (b) Install a new door lock wiring harness seal to the front door lock assembly. (c) Insert the front door lock open rod to the front door lock assembly. 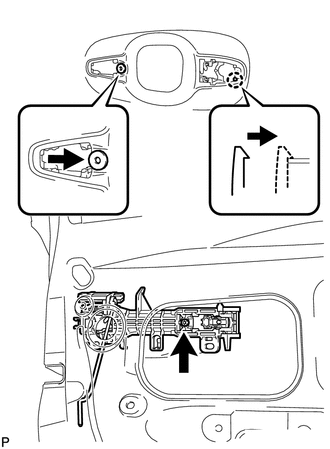 (d) Make sure that the front door lock open rod is securely connected to the front door lock assembly. (f) Using a T30 "TORX" socket wrench, install the front door lock assembly with the 3 screws. 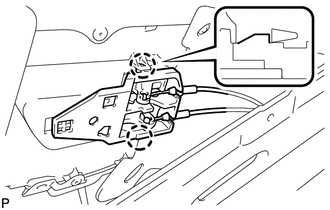 (a) Engage the 2 claws and install the front door rear outside handle pad. 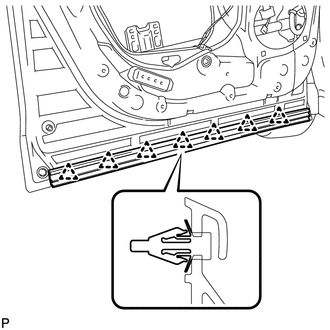 (a) Engage the 3 claws and install the front door front outside handle pad. 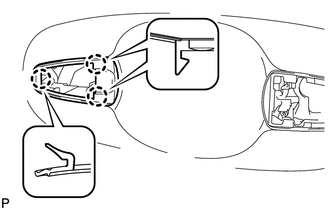 (a) Engage the claw and install the front door outside handle cover to the front door lock cylinder. 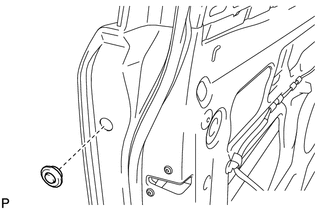 (a) Using a T30 "TORX" socket wrench, install the front door outside handle cover with the screw. (b) Install the hole plug. 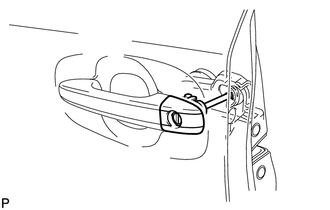 (a) Install the front door outside handle cover with lock cylinder assembly. 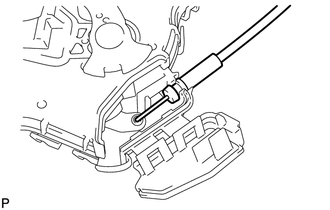 Make sure that the front door lock cylinder rod is inserted into the front door lock assembly. 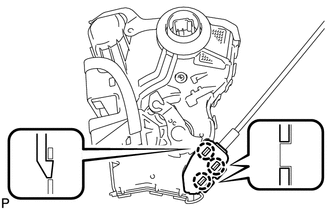 (b) Using a T30 "TORX" socket wrench, install the front door lock cylinder with the screw. (c) Install the hole plug. 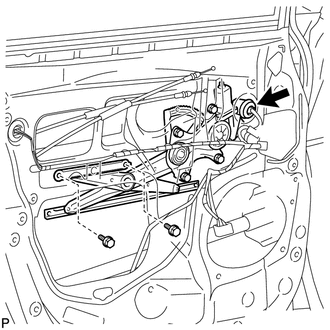 (a) Install the front door rear lower frame sub-assembly with the bolt as shown in the illustration. (a) Install the front door glass run. (a) If reusing the front door No. 2 stiffener cushion. (1) Clean the front door No. 2 stiffener cushion. 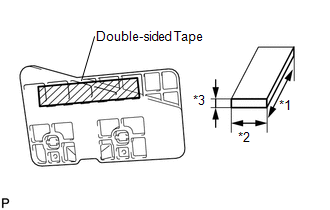 (2) Remove the double-sided tape from the front door No. 2 stiffener cushion. (4) Apply new double-sided tape to the front door No. 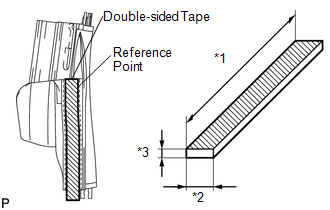 2 stiffener cushion as shown in the illustration. (c) Insert the 2 claws and install the front door No. 2 stiffener cushion. 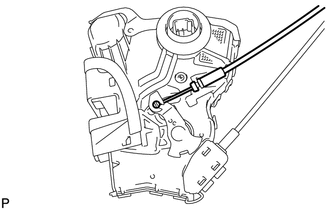 The regulator arm must be below the intermediate position when installing the power window regulator motor. 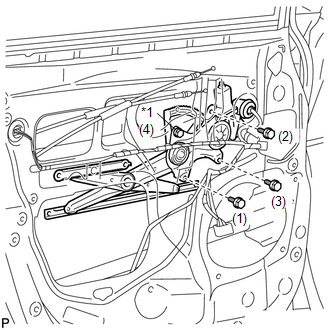 (a) Using a T25 "TORX" socket wrench, install the front power window regulator motor assembly with the 3 screws. 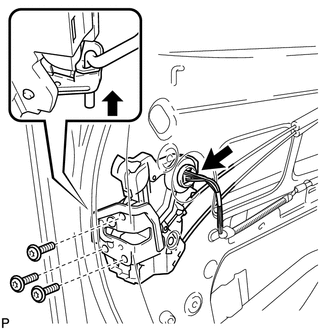 (a) Apply MP grease to the sliding parts of the front door window regulator assembly. 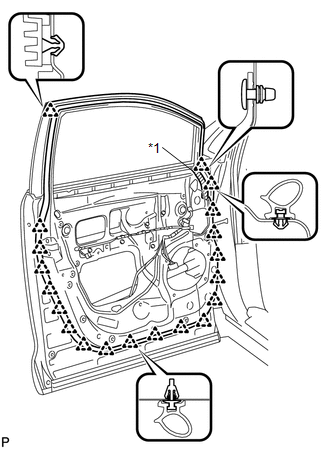 (b) Install the temporary bolt to the front door window regulator assembly. 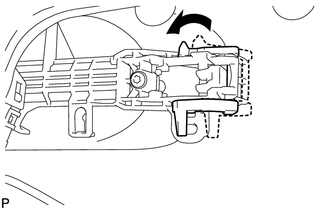 (c) Temporarily install the front door window regulator assembly. 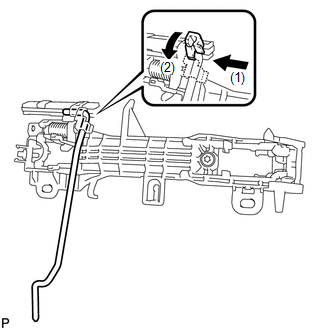 (e) Install the front door window regulator assembly with the 2 bolts. 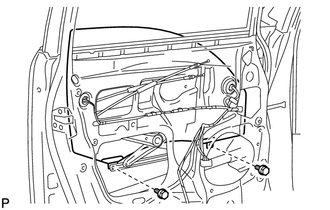 (b) Connect the power window regulator master switch assembly and move the front door glass sub-assembly so that the door glass bolts can be seen. 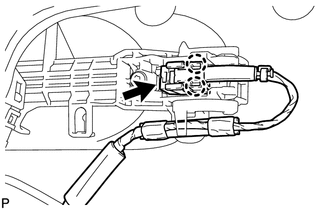 (c) Disconnect the cable from the negative (-) battery terminal and power window regulator master switch assembly. 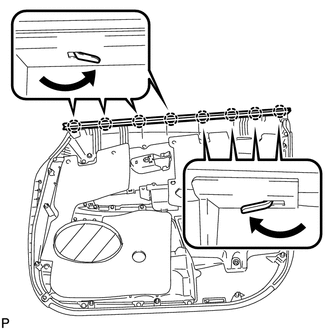 (d) Insert the front door glass sub-assembly into the front door panel along the front door glass run as indicated by the arrows, in the order shown in the illustration. (e) Install the front door glass sub-assembly with the 2 bolts. (a) Apply butyl tape to the front door panel. (b) Pass the front door lock remote control cable assembly and front door inside locking cable assembly through a new front door service hole cover. 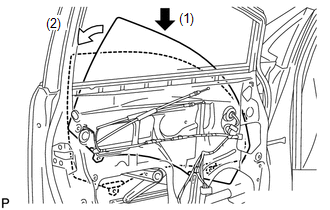 (c) Attach the front door service hole cover according to the reference points on the front door panel. Securely install the front door service hole cover preventing wrinkles and air bubbles. 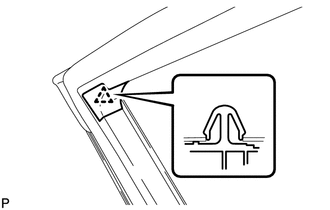 (a) Engage the clip to install a new door frame garnish. 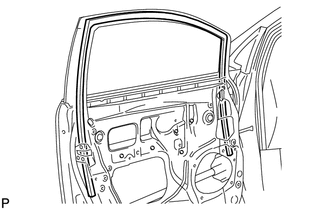 (a) Engage the 8 claws and install the front door inner glass weatherstrip to the front door trim board sub-assembly as shown in the illustration. 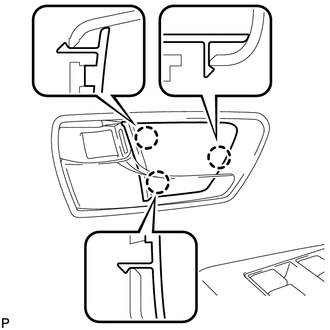 (a) Connect the front door lock remote control cable assembly and front door inside locking cable assembly to the front door inside handle. 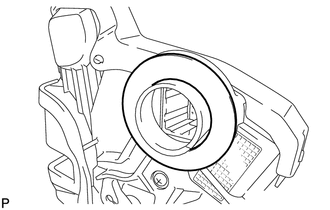 (b) Engage the 2 claws and install the front door inside handle sub-assembly to the rear door trim board sub-assembly. (a) Engage the 10 clips and install the front door trim board sub-assembly. (b) Engage the 2 clips and 4 claws, and install the power window regulator master switch assembly with front door armrest base panel. 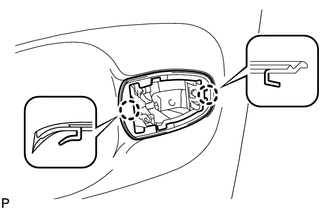 (a) Engage the 3 claws and install the front door inside handle bezel plug.